You are here: Home / Gardening / Save Seeds From Tomatoes, Beans, & Peas For A Self-Sufficient Garden! If you’re a new gardener, chances are you’re wondering how to save seeds. Maybe you want a self-sufficient backyard farm, or loved the taste of this year’s tomatoes and want to try to grow them again next year. On our farm, we try to save seeds so we can have a consistent harvest year to year – I like predictable plants, and over time, we’ve been able to develop varieties that are well-suited to our particular micro environment. In this article, I’m going to show you how to save seeds so you can have the same! What Seeds Should You Save? Although you can save seeds from any vegetable you want, you’ll have a more consistent crop if you save seeds from self-pollinating vegetables. If vegetables have cross pollinated (so the seeds would be hybrids), they might not carry the same genetic traits as their parents. However, if you do end up saving seeds that are potential hybrids, all isn’t lost – you might enjoy the next year’s vegetables even more. Only save seeds from fully ripe vegetables. Choose the best, healthiest vegetables to harvest from. You have a couple choices. You can harvest the pods when they’re mature and slightly dry, and allow to fully dry indoors for 4 or so weeks. A second option I’ve seen farmers use successfully is to allow the pods to completely dry on plant. The downside to this is there’s a chance of mold if it gets rainy or animals can scavenge them before you can harvest them. They could also pop open, spilling seeds on the ground or allowing them to mold. Whichever method you use, be sure to choose healthy, unbroken pods to harvest. 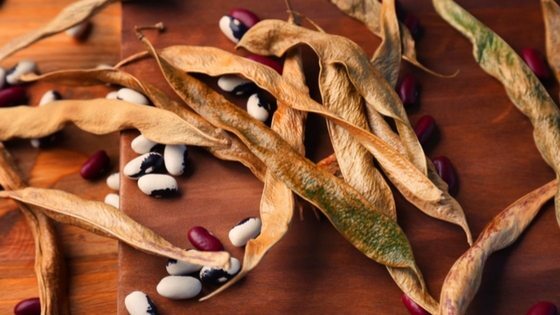 Once completely dry, gently rub pods between your hands to reveal the dry beans or peas. Separate the seeds from the chaff and allow to continue to fry for another 2 weeks. Store in an airtight, rodent-safe container. Cut open a fully-ripe pepper (if it changes color, wait until after the it’s finished) and remove the seeds. Place on a paper towel and allow to dry for 2 weeks. Store in an airtight container in a cool area, out of direct light. Tomato seeds need to be treated differently than the other seeds in this article (this process can also be used for cucumber, squash, and melon seeds). They’re covered with a natural germination inhibitor (the “gel” around a tomato seed) and need to go through a fermenting process to remove it once you harvest the fruit. In nature, the fruit rots and falls to the ground, and the rotting process removes the gel surrounding the seed. Since none of us want rotting fruit hanging around in our house attracting fruit flies, we need to ferment the seeds in a shorter timespan, about 5 – 7 days. After choosing the tomato you want to save seeds from, slice it open and scoop the seeds and pulp into a mason jar. Fill with water and let sit for about a week. It will probably smell, and might give an off-smell. That’s ok (you can loosely cover the jar to keep pests away). As you’re waiting for the fermenting process to complete, check to see if any of the seeds have started to float. If so, remove them and toss. They won’t produce strong seedlings, if they sprout at all. Once fermented, strain out the viable seeds and clean them thoroughly with fresh water. Lay them on a paper towel to dry for a few days. Store in an airtight container in a cool area out of the sun.